In 2009 a cargo plane loaded with 1.7 tons of cocaine crashed on the Honduran island of Utila. A group of us decided to bushwhack through the jungle and find it. 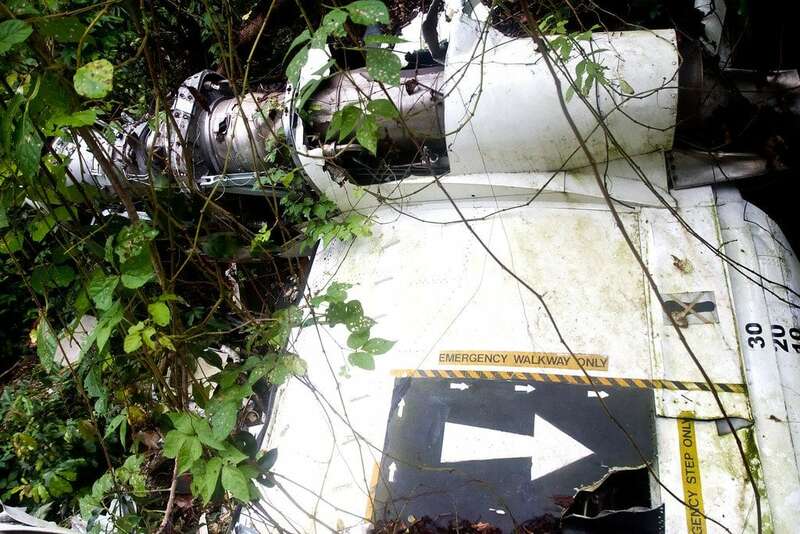 UPDATE: The airplane wreckage was removed from the jungle a few years ago, and is no longer there. Not wanting to embark on a mission like this alone, I recruited my new friends and fellow travelers Robert & Pookie, from Austria and Thailand, to help me with the quest. We began our search at Utila’s desolate island airstrip, known as an occasional refueling station for Colombian cartel planes loaded with drugs. Armed with some basic directions and a compass, we entered the wild Honduran jungle. Keeping an eye out for giant spiders & snakes as we pushed our way through its thick tropical foliage. The ground was rocky, made of razor-sharp coral and covered with hermit crabs of all sizes. Some of these were even climbing trees with their little shells strapped to their backs! So the backstory of the crash is that a Venezuelan flagged cargo plane was getting chased by an American DEA aircraft in the middle of the night. Airplanes loaded with drugs would frequently land on the island of Utila’s remote airstrip under the cover of darkness to refuel for a final journey into other parts of Central America closer to the United States, like Guatemala or Mexico. The Honduran military was ready for this particular plane though, having blocked the runway with trucks so it couldn’t land and refuel. Eventually, the aircraft ran out of fuel in the air — crashing hard into the dense jungle nearby. When the military reached the crash site, they found 3 Colombian men with 1.7 tons of cocaine in the airplane’s cargo hold. Our own search for this locally famous narco-trafficking plane was not looking good. After 3 long hours bushwhacking through an impenetrable tangle of vines & trees, we were almost ready to quit. It was hot, humid, and everyone was getting hungry. Using our compass to determine which direction would lead us back out to the ocean, we decided to head North a bit first, so we wouldn’t backtrack the same way we arrived. Was it possible we’d stumble upon the crash site while walking out? But as we approached, the hidden object slowly revealed itself. We found it!!! The drug plane was much larger than we’d expected. It was a twin engine Jetstream 30, and it had clear-cut a path through the jungle as it crashed, spinning around and facing the way it came in. The aircraft was broken up into three main parts, with wreckage strewn all over the forest floor. We were certain we’d found the correct plane when we discovered a stash of coke in the cargo hold! 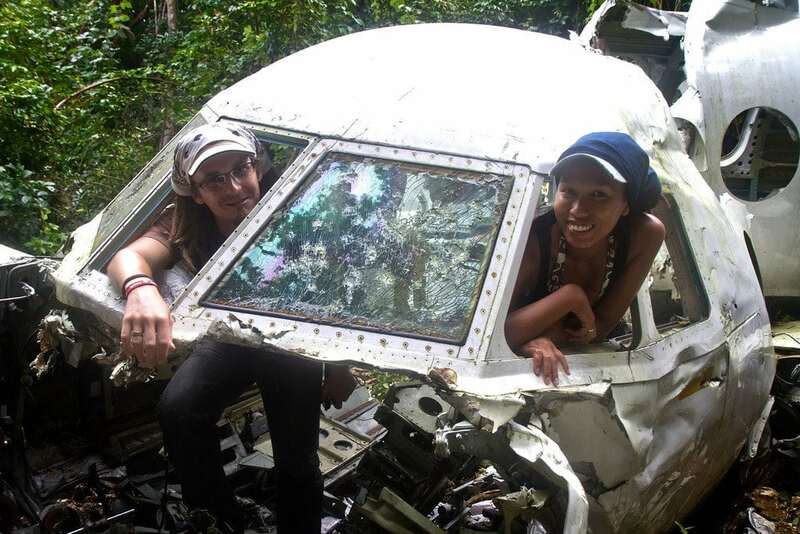 After inspecting the crash site for a while and posing for mandatory Colombian narco-trafficking aircraft photos, we hiked back out of the jungle getting lost a few times along the way. It’s a good thing we brought a compass, or we’d be spending the night in there! Finally breaking through the trees and making our way back to the local airport. As we strolled down the airstrip runway again, we spied a group of tourists at the tiny outdoor terminal, waiting for a plane to take them off the island. You should’ve seen everyone’s faces as the three of us, dirty and soaked in sweat, emerged from the jungle and walked across the runway towards them. The heavily armed Honduran soldiers who I’d spoken with earlier just gave us a nod as we approached. I’m pretty sure I knew exactly what this group of airline passengers was thinking. Who are these dirty hikers and what the hell are they doing in the jungle next to an airstrip? Everyone was staring at us. We didn’t say a word as we casually strolled past the group, deliberately increasing our mysteriousness in their minds. Read an actual news story about the crash here: Venezuelan Narco Plane Crashes on Utila. RentalCars.com is a great site for comparing car prices to find a deal. Are you afraid of giant spiders? Would you have searched for this airplane? Let me know in the comments below! THE PLANE IS NO LONGER THERE. This post being updated in 2018 has people looking for something that no longer exists. Very interesting story. I doubt that I would try that. 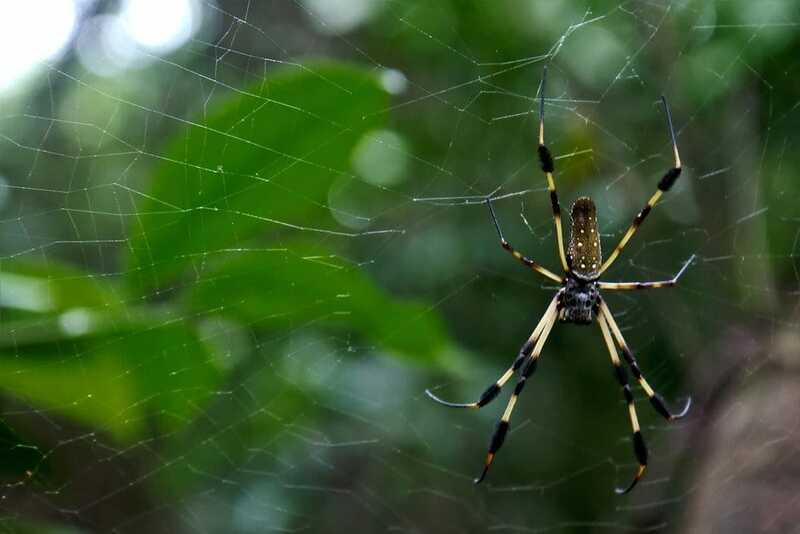 A very interesting experience – one I wouldn’t never ever try – I hate spiders. Only 10 minutes if you know where it is! :-) Too bad they removed it, was a cool little adventure. I’ll have to add the crash site to my exploration bucket list. I´m slowly getting more and more pulled into this blog. You´re a good storyteller. It´s straight-forward, simple and honest. I likey. I must find myself some ex-narc adventure tourism now! I lived in Utila for about a year and a half back in 1998/99 and there were no drug problems. It started a few years later. All the locals knew about these planes. Drug money and drugs found their way into the island. I hear it’s got better since 2009. And, them spiders! They are all over the island! The spiders are beautiful to look at, but I wouldn’t want to run face-first into one of the webs! Thanks for sharing your experience Jamie. Awesome sounding adventure…I have been looking for the plane for 2 days but still no luck :( Where abouts near the airport strip did you go? ‘the locals’ and long term residents have told me mixed stories…some say east of pumpkin hill others say west and some say south of the runway?!?!?! Also where did you find those red parrots i see in your awesome detailed photos? I wish I could give you better instructions Nick, but we just walked to the end of the runway by the ocean, took a left, walked parallel to the ocean for a bit, then took another left and headed into the jungle were there seemed to be a bit of a trail. But we lost the original trail, and just wandered for a few hours back there. It was luck. As for the birds, I don’t remember where they were either. It was a lunch stop on our bus ride from Tegucigalpa to Nicaragua. You rebel! That looks like a lot of fun! 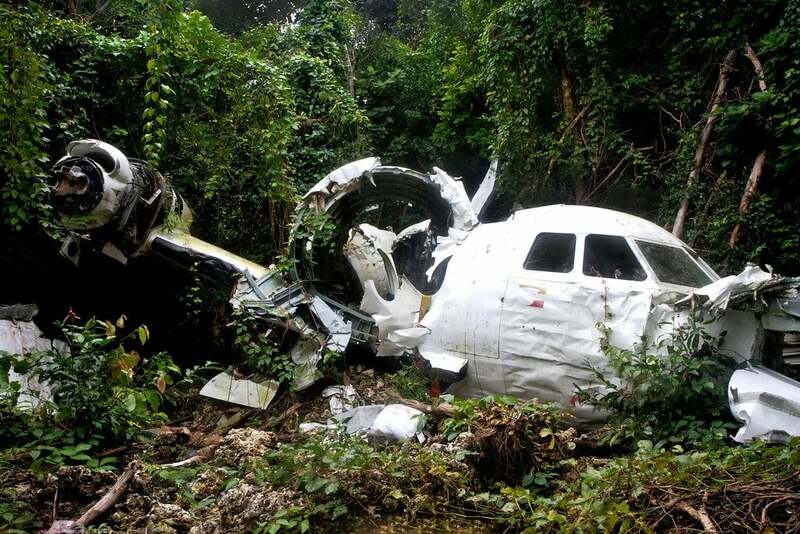 Would be really cool to stumble upon a “downed” plane in the middle of the jungle. although that makes me a little guilty as someone could have died in the crash… sadface..
Yeah, but someone who worked for the cartel. I don’t feel that bad for him. It’s a dangerous business, drug smuggling. Wow! What a cool adventure! What an adventurer you are! This story would be a perfect fit in our adrenaline adventure series this month. Hi. I just visited that plane a couple of days ago. If anybody’s interested, I posted directions for getting to the plane along with GPS coordinates. It just wouldn’t have been the same without finding some kind of addicting substance in there! That’s an awesome authentic backpacking experience. Nice job seeking it out Matt. Haha the coke was a nice touch. Well placed caption up on top too. I´m glad you found a plane in the end, this is a great story, thank you for sharing! Great story Matt! 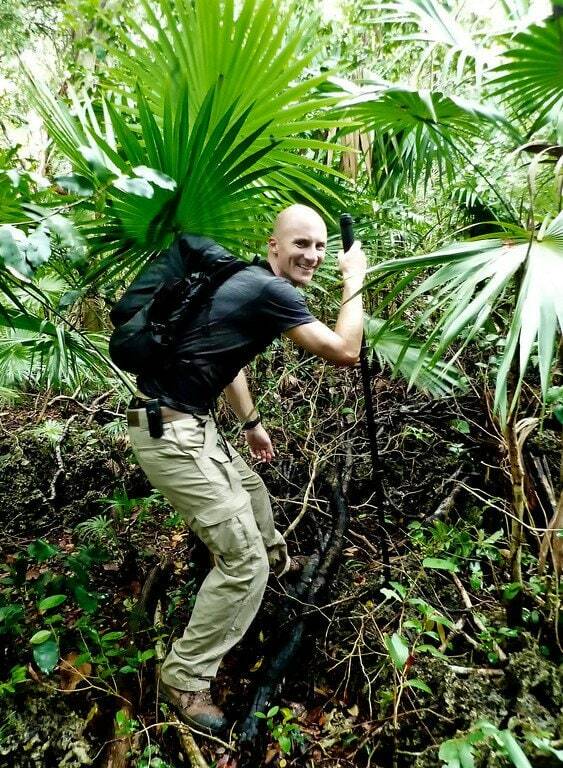 I love jungles and I love hiking, sounds like a adventure right up my alley. Cheers! Glad you liked it Ryan! The real question here is: Did you find any Diet Coke? Loved the story Matt, this is one of the reasons I love to travel. You do stuff that you’d likely never do at home. Fun! I agree with Andi, the spider is definitely not cool, but that is part of the adventure. Persevering giant spiders to reach the goal adds to the fun. 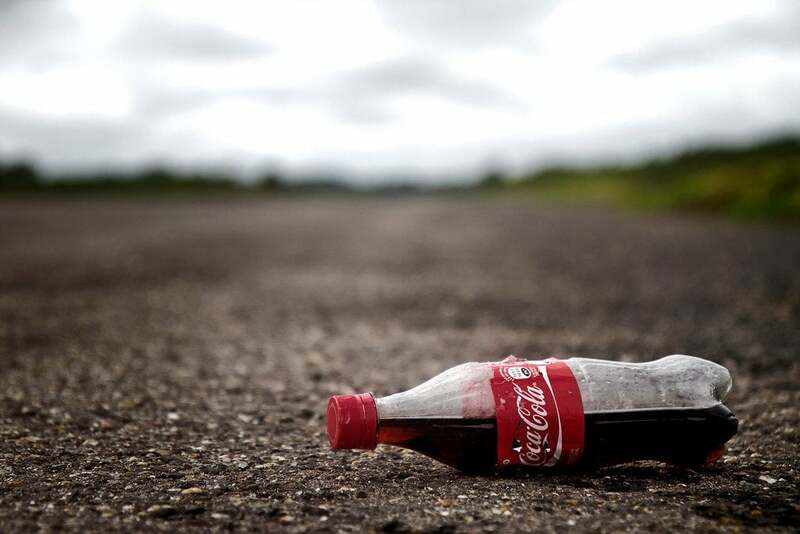 with the coke you found what did you do with it? What a cool adventure your wanderings do keep me on pins and needles. Photos are really spendid. What a fun trek Matt. I’m planning to head to Utila for a bit myself after some volunteer wok for a doctor friend near Rio Dulce. I’m enjoying La Escuela Cooperativa. Glad to hear! Say hello to Flory for me. Stand aside, Indiana Jones!! What an adventure–how did you find out about it? 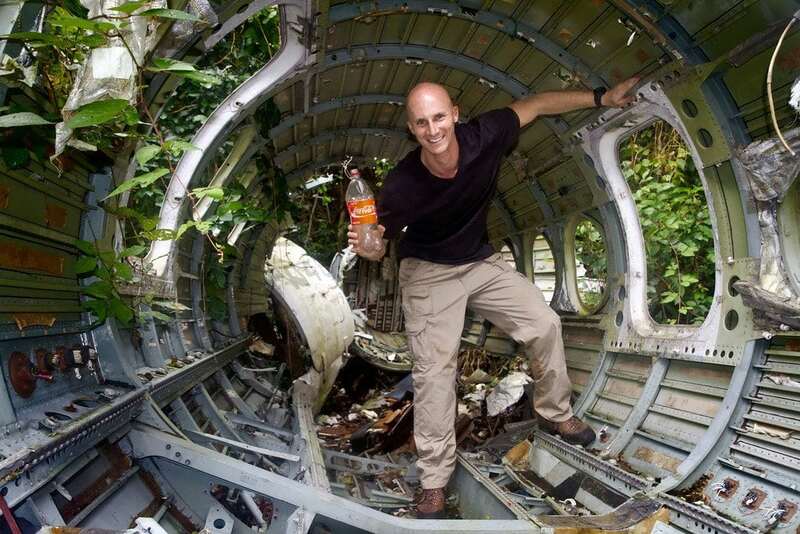 Can’t believe that the plane is STILL sitting there, in the middle of the jungle! I heard rumors of a crashed plane, but no one knew where it was. Even locals. It took a while, but I finally found someone who had been there. Now then, your “teacher room” that’s a jungle! Maybe there is a plane in there, too. Maybe even King Kong. So you found Coke! Snort Snort! Did I mention that I”M in charge of ALL corny jokes? What’s the dope on that spider? When are you taking a powder from Honduras? Just remember, any funny lines have to go through me. Lol, you found coke! Now how to smuggle it past the TSA agents back home. Hmmm…. Ay Dios mio, you found it!!!!!! How cool! Though that spider is NOT cool at all.